Ken Hinrichs, who served as head football coach at Manual High School for 17 years, compiled the highest winning percentage in the history of local sports. He was also an outstanding lineman for Bradley. 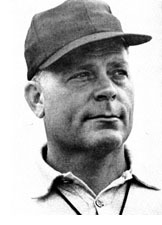 He coached four unbeaten teams and during one five-season stretch (1956-1960) his teams went 45-2-3. His teams lost two or fewer games in nine of his 17 seasons and his total career won-lost record of 121-40-7 for .752 is the strongest ever compiled by an area coach with a tenure of more than ten years. The 3,891 points scored by his teams is the most in the history of Peoria high school football. Several of his Manual teams were ranked among the state's top ten, and his teams were always known as well disciplined, superbly prepared units.